Mavis Oehlerking, who has almost single-handedly spearheaded Shaunavon’s food bank for the past eight years, is stepping down. Fortunately, the local initiative will be picked up by an equally dedicated group of volunteers. “It’s such a privilege to know that someone else will take up the challenge and it will continue,” said Mavis. 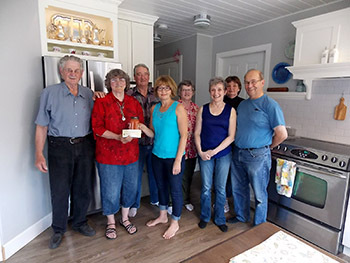 The new Shaunavon Food Bank will operate under a new name and under the guidance of a small group of volunteers. The committee recently met to elect an executive and map out a plan for its future. The new initiative is community-based. The Food Bank is not affiliated with any particular group or organization. The new entity was officially launched yesterday (June 1). The group, however, is basically going back to the drawing board with the effort and they have a somewhat daunting task ahead of them. For starters the Shaunavon Food Bank is in need of a facility that can be used to house the program. They are following up on a possible lead. The group does have some temporary storage space that it will use on an interim basis. There will also be no carry over of names of food bank recipients from the past. The new Shaunavon Food Bank has already set up a phone number (306-294-9111) and opened a post office box (Box 81). On top of the obvious food donations, the group will also be in need of other assistance, including funds to help cover every day costs such as phone bills and energy expenses. The group will also need items such as freezers, refrigerators and shelving. The group is also putting out a call for volunteers. Organizers hope to continue to have a donation box at the Shaunavon Co-op Marketplace Food store. They also plan to place donation boxes at other Shaunavon locations in the future. Eventually, organizers would like to see the Food Bank open during regular, part time hours, although all plans at this point are in the preliminary stages.